Valletta ou Valete Ville Forte, de l’Isle de Malte. P. Mortier, Amsterdam, 1730. On March 14, 1566, just six months after the lifting of the Great Siege of 1565, the Order of St John set out to build a new fortified city as its seat in Malta, on the Xiberras peninsula between il-Porto Grande and Marsamuxetto. Grand Master Jean Parisot de Valette laid the first stone of the city on the 28th of the same month, but unfortunately died before he could see the city taking shape. The task was placed in the hands of the Order’s leading military engineer, Francesco Laparelli, who was the personal architect of Pope Pius V. Pope Pius was a great benefactor towards the building of the city. The new city was meant to be the first of a series of fortified areas to guard the entrances to the two harbours. Haste was the prime factor and the Order wanted to have the main trace of fortifications ready due to the imminent threat of another attack by the Ottoman forces. Although not the original idea, the city ended being built on Bernard Palissy’s grid-iron pattern, where the streets started just beyond the enceinte, or land front fortifications, and travelled parallel down to Fort St Elmo. Twelve other streets crossed them from the Grand Harbour side to Marsamxett. The new city was named Valletta after de Valette. Its principal defences were a restructured and strengthened Fort St Elmo, a system of fortifications and ditches that encircled the entire city, an arsinale for the repair of ships and a small secluded harbour where ships could be sheltered during storms or an attack. This latter particular feature is the subject of this article. The building of Valletta’s fortifications, palaces and houses was regulated by a code administered by a section of the Order titled Officio delle Case, which was already operational during the Order’s stay at Vittoriosa. The officio had decreed that the inner harbour for the galleys was to be located on the Marsamxett side of the city and that stone for the building of Valletta’s fortifications was to be quarried from the site. 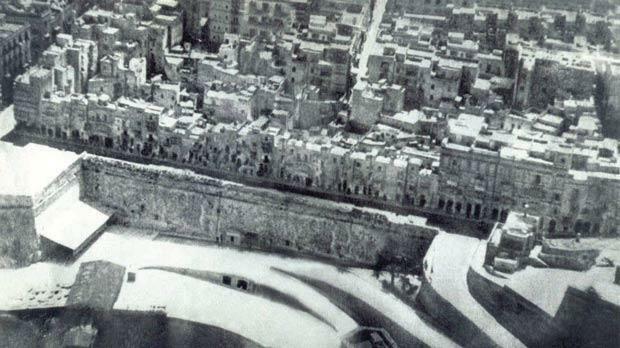 The stone for houses had first to be quarried from the site where the property was to be built but any additional stones were to be sourced from this planned refuge for the Order’s galleys, located between St Andrew’s Bastion and San Salvator Curtain, overlooking what today is the town of Sliema. The site soon took the name of Mandracchio, or Manderaggio, which was then twisted into Mandraġġ by the locals. Mandraki was the name given to the galleys’ shelter, surrounded by circular fortifications, that the Order had built in Rhodes, which they had occupied since 1309 but which was lost to the Saracens in 1521. The harbour in Rhodes is still called Mandraki. The Mandraġġ concept was not a new idea, as when the Order had occupied Vittoriosa, the watery channel between Castello Sant’ Angelo and the borgo was used for this purpose. Another shelter was planned at a location facing Bighi, apart from the bacino, the natural alcove at Cospicua, where the British later built No. 1 Dock. According to other writers, the name Manderaggi originates from the word mandar, which means or refers to the layer of dirt and spoils that settles in the hull of galleys, which made a good fertilizer; the people who cleared out this material were called Mandarini. There are various others interpretations varied; for example mandra in Maltese refers to swill. 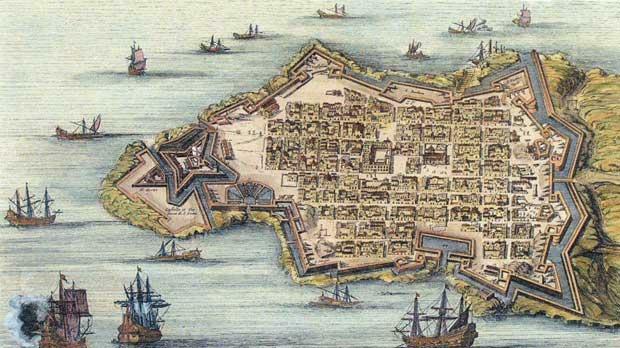 Luckily, many contemporary plans of the Mandraġġ exist, the oldest of which was published in Rome by Antonio Lafrerj with the title: Disegno della nuova città di Malta. Most show the space either as a rectangle or oval shaped. Among them was La nuova citæ fortezza di Malta chiamata Valletta, by Matteo Perez d’Aleccio published in Rome in 1582, and Valletta die new stat Malta by Daniel Specklin published in 1585, which apart from the Mandraġġ, also includes the arsenale in the area today known as is-Sur tal-Franċiżi or id-Due Balli. There are also Valletae civitas monte repleta, attributed to Philippe Thomassin, published in Rome in 1586, another by Pierre Mortier published in Amsterdam, Holland, around 1663, and others. The building of Valletta proceeded at a steady rhythm, particularly the quarrying of stone from the Mandraġġ. Unfortunately, stone of inferior quality and possibly harder to quarry was soon encountered. Subsequently, the Order’s engineers realised that the space was too small to accommodate the entire fleet, especially the battle squadron, and that the location was subject to the strong winds and currents created by the maestrale. Plan of the Marsamxett area of Valletta showing the Mandraggio. Photo: C.D. Office, Works Dept. Right: Mangraġġari washing and fetching water at a metal hand pump. Furthermore, the new city was now safeguarding the entrance to the Grand Harbour, which, as a natural harbour, was endowed with numerous sheltered creeks and inlets. Therefore, work on this excavating this man-made harbour was halted and the idea of a Mandracchio was scrapped. The plan by Lapparelli for an arsenale near St Elmo suffered the same fate. While the Mandracchio was being quarried, a gap had been left in the centre of the curtain to serve as an entrance to the site. When the project was halted, the span of this breach was closed and the difference in the stone used can still be noted to this day. Between 1575 and 1600, shacks and rooms were erected in the Mandraggio without any conformity to the grid-iron plan of Valletta. Most were inhabited by workers who came to Valletta during its building boom and later to seek their fortune in the new city. Many ended as destitute and either scraped a living doing any menial work or turned to crime, which was common among the poor in European cities of the time. The houses that flourished in the Mandraggio continued to increase, giving the area a totally different ambience from the rest of the city; its streets were a labyrinth of narrow and dark alleys. Poverty and all that goes with it prevailed. Due to the height discrepancy, some of the houses close to the fortifications were as high as eight floors, while those to the rear were only of two floors high. However, the houses that flanked the four streets that bordered the Mandraggio were all aligned with the rest of the streets but any houses built behind them were built at random in the maze of alleys. Some foreign visitors had compared the Mandraggio to the medina of North Africa cities. The borders of the Mandraggio were Marsamuschetto Street on the Marsamxett Curtain, St Patrick Street, which ran parallel to it at rear, with St Mark Street and St Lucia Street on each side. The principal entrance to the Mandraggio was from the stairs once located at the lower part of St John Street, where the renowned confectioner Neriku had started his business. 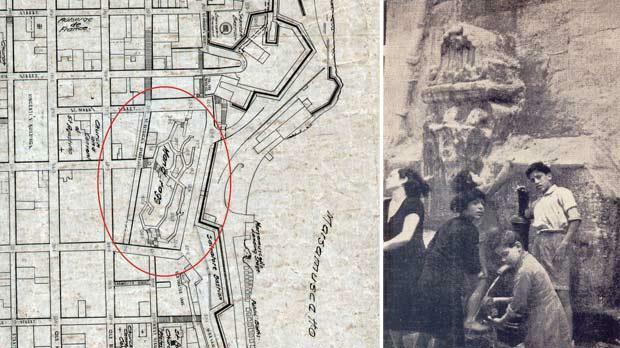 One of the two secondary entrances or narrow stairways was in St Mark Street and was known as il-Mina taċ-Ċintura (the arch of Our Lady of Consolation), and the other in St Lucia Street known as It-tomba tal-Mandraġġ (the ‘grave’). 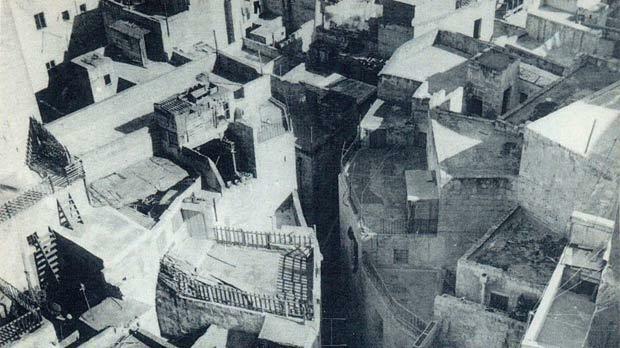 Most areas within the Mandraggio also had names, such as Ir-Rokna (the ‘corner’), iż-Żenqa (the ‘narrow steps’), il-Kwartier (the ‘quarters’), il-Gandott (the ‘ditch’) and id-Dranaġġ (the ‘sewer’). The famous arch at St Patrick Street was immortalised in many old postcards. The Mandraggio had two main alleyways, Strada Manderaggio and Strada San Giorgio, although there is some doubt whether the latter name was official. The wide part of the Mandraggio was known as Il-Kortil, as it resembled a large courtyard. Early in the 20th century the Mandraggio was reputed to have 333 numbered doors, some being kerreja, or small tenement houses. The house of the famous artist Mattia Preti was located in St Patrick Street. In the area there were also grocer shops, greengrocers, wine, tea and coffee shops, as well as one or two cookhouses. A vivid description of the Mandraggio was given by W.H.Burrell in 1854 who described the zone as crammed with people and animals, unhygienic, dark, dirty and humid. The British author had written about what he had witnessed and wanted to be graphic in his description in order to prick the conscience of the authorities on the situation in the Mandraggio and on why had so many had perished in the plague of 1813. A system of water supply in the dwellings in the Mandraggio was unheard of, other than that of fetching water from a number of natural springs in its precincts. The first water for drinking and other purposes arrived at the Mandraggio in 1615, when Grand Master Alofius de Wignacourt constructed an aqueduct that conveyed water from natural sources in the Rabat region, which made its way into a number of rock-hewn cisterns and supplied fountains in Valletta. A cistern that could hold 300,000 litres of water and two fountains were built to supply water for drinking and washing to the Mandraggio. Any overflow would run down to the sea through special ducting in the bastion wall. This was an innovation that served to bring new life to the area’s inhabitants. The two fountains were similar to another by Wignacourt near Porta Reale, which usually bore a putto’s face or lion’s head with water sprouting from their mouths. Above the heads were two escutcheons, one bearing Wignacourt’s coat-of-arms and the other showing the symbol of the Langue of Auvergne, the Dauphin houriant or ‘upright dolphin’. The sculpture was by Giuseppi Casanova and the fountains were constructed by Grezzju Imbroll u Indri Farrugia, along with their assistants and slaves. It is believed that this upper fountain had nearly disappeared by the beginning of the 20th century but was recorded as being next to a carpenter’s shop with door number 297. Nevertheless, hygiene in the Mandraggio was still lacked behind the rest of the city, and this resulted in sickness and even death. Flies were still considered as pests rather than carriers of diseases. Although Grand Master Ramon Perellos y Roccaful had brought to Malta engineer Romano Carapecchia in 1707 to construct a drainage system in Valletta, it is very doubtful whether the system ever reached the Mandraggio. In the part of the Mandraggio called the Zenqa, there was a cesspit with a wooden cover that was always kept whitewashed with lime, into which was dumped all natural wastes. This was one of 19 known to exist along Strada Manderaggio. There were also a number of grilles on the ground, connected to the ducting in Triq tal-Kanal, from which all water, rain or otherwise, cascaded to the sea on the other side of the curtain wall from an opening some four metres above sea level. Water for all needs of the population of the Mandraggio was drawn the two fountains. They were also the meeting place for the women who went there either to fetch water for cooking or washing, or to bathe their brood of children. Others would carry large zinc tubs with their daily washing or just to chat friends or neighbours. There were times when a heated argument broke out and one can imagine the tongue lashing that they gave one another, probably joined by other kin, and no one in the family tree was left unscratched, dead or alive! These were mostly just spur-of-the-moment arguments although the incidents would never be forgotten. These same people were also very religious and welcoming. The Mandraggio was renowned for its devotion towards Our Lady of Mount Carmel, better known as tal-Karmnu. At the time there were only two parishes in Valletta and Mount Carmel church was the church of the Mandraġġari. Names such as Karmena, Mananni, Karmnu and Marija, even in their English versions, were very common up to the 1960s. Although the inhabitants of the Mandraggio were constrained to live in such squalor, they weren’t of such bad stock as one would imagine. They were rather a reserved type, hard-headed and unlikely to want to mix with others beyond their borders. It could well be that not many wanted to be linked in any way with people from the Mandraggio due to the stigma associated with their poor living standards. In most Maltese villages till well after World War I, such attitudes were very common, and even marriages outside the local village circle were rarely permitted. Most of those who lived in the Mandraggio were somehow related to each other, just like in the Mandraggio of Vittoriosa, where even till late in the 20th century, four or five surnames were predominant. For obvious reasons, people from other districts of Valletta, and even more outsiders, did not venture into the Mandraggio, other than priests, the police, sanitary inspectors and very few others. A statue of St Paul stood at the corner of St John Street and St Patrick Street, yet on most facades, by the doorway one would see tiny niches dedicated to Our Lady of Mount Carmel or to Our Lady of Consolation. The latter was venerated in the church of St Augustine, and on its feast day, small wooden altars complete with candlesticks and a copy of the Madonna’s altarpiece were erected. Like elsewhere in Malta, there were also plenty of niches mainly dedicated to St Rocque, St Joseph, Our Lady of Lourdes and St Rita. At a time when social services, good sanitation and sound employment were very lacking, the only other refuge was the Church and divine providence. The passage of time did not change the Mandraggio very much. Its population was always large, given that families had many children. As many as four people lived in one room. One wonders how the poor mothers managed to keep their children happy, properly dressed and fed when most fathers had to struggle for a living. Most were hard-working men but others just gave up and fell foul to drink and vices with bad consequences on their wives and children. However, these were hard times all over Malta and this situation was common in every town and village throughout the island. Men from the Mandraggio who had a job were known to be hard-working and capable. Being next to the sea, many were employed on the Order’s galleys or other craft. The Order’s bakery, built in 1584 and located just two streets away from the Mandraggio, had remained in use until very early in the 20th century and men from the Mandraggio worked there to become excellent bakers. With the arrival of the British, other men from this area enlisted as sailors with the navy of the new sovereign. Living by the sea, many became excellent boatmen and fishermen at an early age, and the latter could bring some freshly caught fish for the family to eat or barter. Synonymous with the Royal Navy were the ‘bum-boats’, where a boatmen would buy items of necessity, and on particular days were allowed to go alongside a vessels or even on their decks, to sell their wares to the ship’s crew at a small profit. Nearly a century later, the section of Valletta on the Marsamxett Harbour side near the Mandraggio was named the Marsamxetto Ferry Landing, since a steam ferry service was introduced to Sliema, Valletta and the Three Cities. Therefore, this part of Valletta’s foreshore became synonymous with the Mandraggio and became its ‘seaside territory’. Either because they had large families to feed or because they possessed some talent and wished to use it to make a better life, others from the area excelled in playing musical instruments and made a name for themselves. It is a known fact that for more than a century, certain areas in Valletta were notorious for being a haven for sailors and soldiers from Britain and the Empire. They had wages but nowhere to spend it, and in Valletta they could find what their heart wished for. Valletta had grog shops by the dozen, especially in Strait Street or ‘the Gut’, as it was known with the men in uniform. Many men either ran these shops or worked as barmen, waiters, chuckers-out, dishwashers, errand boys and any other work involved with the trade. Others were bandsmen with the ‘Nazzionale’ or with ‘Ta’ l-Istilla’, and did part-time jobs entertaining ‘Tommy’ or ‘Jack’ in one of these bars, from which they could earn some extra money. British sailors were known to get quite drunk and trouble always followed. Fights broke out easily and the Maltese were united and hard fighters. Others would dare to risk ‘clearing’ any loose change left on any tables or from the pockets of any sailor unconscious on the floor.